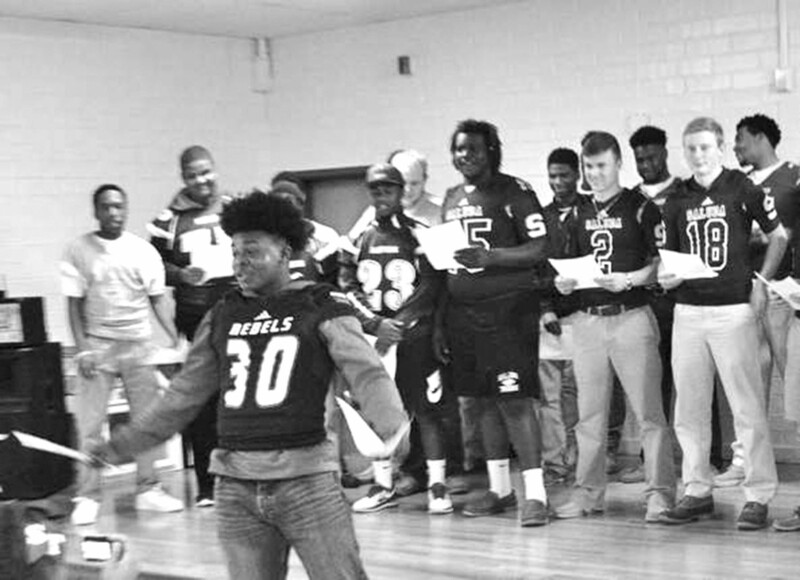 Strom Thurmond Rebel Jaquan Edwards leads area players in singing fumble. 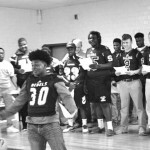 NFL Mothers and 30 High School Football Players, along with their coaches, teamed up with Edgefield County Youth Empowerment Center (ECYEC) to bring joy and good tidings to financially challenged families during ECYEC’s Annual “Christmas in the Community Festivity.” “The event is geared toward easing the stress of financially challenged families during the Christmas Holidays by providing toys and clothes for the children,” says Marcella Edwards, CEO of Edgefield County Youth Empowerment Center. “The holiday season can be a season of excess,” she continued. “With the Thanksgiving feast behind us, we were then in all-out Christmas shopping mode. There’s also plenty of food and gatherings with friends and family — but for many families, this was the time of year they dread because of financial constraints,” says, Edwards. “Holidays such as Christmas hit financially challenged families the hardest. When you are unable to feed and clothe your family, putting toys under the Christmas tree isn’t a priority,” says, Edwards. Each year ECYEC is able to serve more families due to the partnership of others, such as the NFL Moms. Two Professional Football League Player’s mothers brought gifts to the children during the festivity: Angela Watson whose son Dakoda plays with the New England Patriots along with Delores Hazel, whose son Matt plays with the Miami Dolphins. In addition, 30 high school football players from various high schools: Strom Thurmond, Wardlaw Academy, South Aiken High, Ridge Spring, Batesburg and Saluda brought great laughter to the children when they ‘fumbled’ singing, We wish you a Merry Christmas. Their coaches were in attendance to enjoy the laughter: Coach Hillary, Coach Rodgers, Coach Hamilton, Coach Lipsey, Coach Bryant and Coach Young. The players were amazingly funny and entertained the children,” reported Edwards. She noted that they are believers in“Teamwork.” it maximizes the strength of our organization; having the continued support of the NFL Mothers , local individuals, and businesses gives us an opportunity to broaden our services in the community. The organization is very grateful to be able to meet the needs of others as others have met ECYEC’s needs throughout the years. “It is never about how many people can serve us, but it’s about how many people we can serve,” added Edwards.